In the booklet accompanying the CD, Phillips states that this is the final instalment of his solo double bass albums. A process that began, almost by accident, fifty years ago with the recording of Journal Violone which was originally recorded to provide the source material for a composer friend. The resulting recording was deemed so impressive, and complete as it was and subsequently released. In the intervening years the bassist has released further sol albums and worked at developing his unaccompanied playing in many private sessions and public performances. In this final chapter the maestro shows, in a stunning and varied set, just how far he has taken his music . Drawing influences and experience from both classical and jazz idioms, along with his work with others and alone, Phillips presents three pieces, 'Quest', 'Inner Door' and 'Outer Window' which utilise five different areas of prepared material that were to be explored. To this end the bassist suggests that producer Manfred Eicher 'co-composed' the album by, as he says "putting the pieces in order while I was still playing them". Each composition is comprised of individual parts, usually separated into sections that are played arco or pizzicato, and all are equally concerned with melody, texture and harmony which perhaps leads to the arco performances leaning more towards the classical tradition, and the plucked strings having a more loosely structured melodic feel. The rhythmic elements of the music are explicitly emphasised on 'Inner Door - part 4' with its driving bass lines and the delicate approach taken on 'Outer Winder - part 2' with its subtle juxtaposition of texture and dynamics. 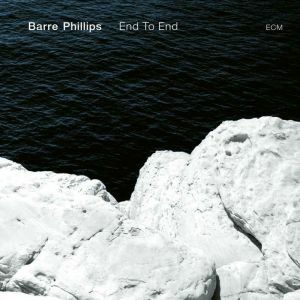 With End To End Barre Phillips avoids all the pitfalls inherent in solo performance, and provides an album that is truly captivating from start to finish, and a fitting coda to the solo bass recordings begun six decades ago.